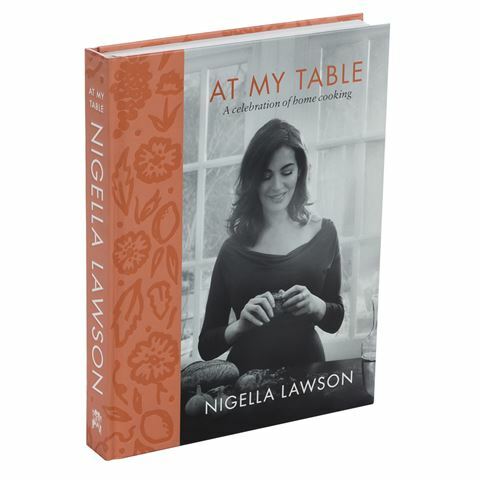 Join one of the most renowned celebrity chefs in Nigella Lawson’s At My Table. This new cookbook celebrates the food Nigella cooks up at home, ranging from traditional dishes with a twist including Sticky Toffee Pudding and Cellophane Rolls to adventurous and original creations such as Aubergine Fattet to White Miso Hummus. With such an eclectic range of recipes and stunning photography throughout, craft memorable dishes and spark up some chatter around the room with At My Table. Over one hundred recipes dedicated to celebrating home cooking. Recipes range from breakfast ideas to entrees, salads, seafood, chicken, lamb, beef and desserts. Beautiful photography by Jonathan Lovekin. Cover photography by David Ellis. Includes tips on making ahead and storage for each dish towards the back of the book. Begins with an introduction penned by Lawson. Includes a full index and acknowledgements at the back. Published by Chatto & Windus. Dimensions: 19.5cm (l) x 25.5cm (h) x 3cm (w).